Only partial results available. This was an 8-player knockout tournament. Three games were to be played between each pairing of players (or possibly three wins were required). 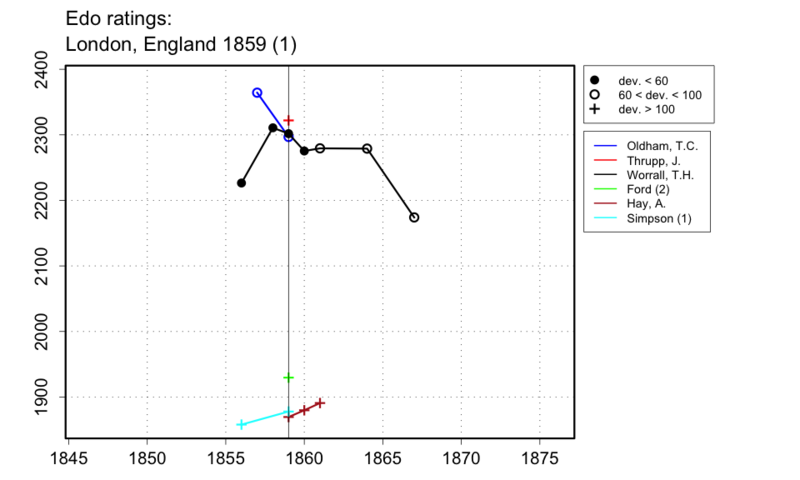 We are told that Thrupp beat Oliphant and that Oldham beat Hodgson, but not by what score. I use 1-0 to be conservative. At the time of the first report in the Era (30 Jan. 1859, p.5) Hay had won one game against Simpson, but at the time of the second report (6 Feb. 1859, p.5) Simpson had gone ahead, and so must have won the encounter. I will guess at a score of +2-1, to be conservative but to use the knowledge that Hay won at least one game. Similarly, at the time of the first report Worrall and Ford had drawn their first game, but the second report shows that Worrall had gone through. I will guess +1-0=1 to be conservative. The second report gives a partial result Worrall-Oldham of +2-0=0 for Worrall. The third report indicates that Worrall won this encounter, but doesn't give a score, so I will leave it at +2-0=0. It also indicates that Thrupp must have beaten Simpson, which again I indicate by 1-0, no score being given. The final was between Thrupp and Worrall, Thrupp winning 3-1. The identities of some of the players is unclear. Was Oliphant, for example, as I am supposing, Carel Naret Oliphant? Or could it have been H.W. Oliphant?